©1994 Paramount Pictures. All rights reserved. 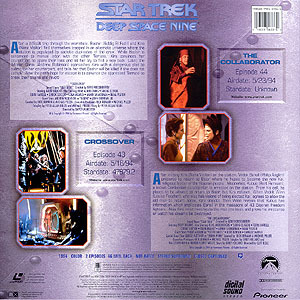 After a difficult trip through the wormhole, Bashir (Siddig El Fadil) and Kira (Nana Visitor) find themselves trapped in an alternate universe where the station is populated by sadistic duplicates of the crew. While Bashir is sentenced to manual labor with the other 'Terrans,' Kira convinces her counterpart to spare their lives and let her try and find a way back. Later, the 'Mirror' Garak (Andrew J. Robinson) approaches Kira with a dangerous plan to overthrow her counterpart, and tells her that Bashir will be killed if she does not comply. Now their only hope for escape is to convince the oppressed 'Terrans' to break their chains and revolt! After visiting Kira (Nana Visitor) on the station, Vedek Bareil (Philip Anglim), prepares to return to Bajor where he hopes to become the new Kai, religious leader of the Bajoran people. Meanwhile, Kobus (Bert Remsen), a known Cardassian collaborator, is arrested on the station. From his cell, he pleads to be allowed to return to Bajor, but Kira refuses. When Vedek Winn (Louise Fletcher), who also has visions of being selected Kai, agrees to allow the old man to return home, Kira objects. Then Winn reveals that Kobus has information which implicates Bareil in the massacre of 43 Bajoran freedom fighters. Now Kira must investigate the man she loves and prove his innocence or watch his dreams be destroyed.